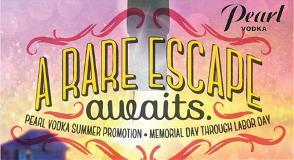 Pearl Vodka Summer Promotion – A Rare Escape Awaits! This Summer, Pearl Vodka is taking it up a notch by offering “A Rare Escape” for two lucky Pearl drinkers to Bora Bora’s Exclusive Pearl Beach! The objective of this unique promotion is to introduce consumers to Pearl Vodka, increase brand awareness, and incent consumer’s to purchase by creating a Brand Buzz during Pearl’s key selling season (Memorial Day thru Labor Day). This program will be supported by a National and regional media plan (including digital, social, trade print, and search), as well as retail/account support, including retail POS, display enhancers and branded giveaways, and a $3 mail-in rebate. Check out the below docs and info for more information. ***Please contact Ashley Ulkus with any comments or questions.